Ok, so you have started laser tattoo removal at a reputable clinic (we hope), and you have had your first treatment using a medical grade laser. What now? 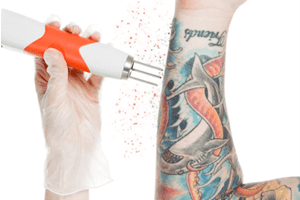 You may not be aware, but tattoo removal is a two-step process. Assuming your clinician has conducted the perfect treatment, the second part of the process relies on you as the client to ensure proper care of your tattoo leading up to your next treatment. Directly after treatment you will leave the clinic with your tattoo feeling sore and irritated, but the great news is the fading has already started! The results you have been assured of, are already well on their way, but now YOUR job begins. Check our results out HERE! 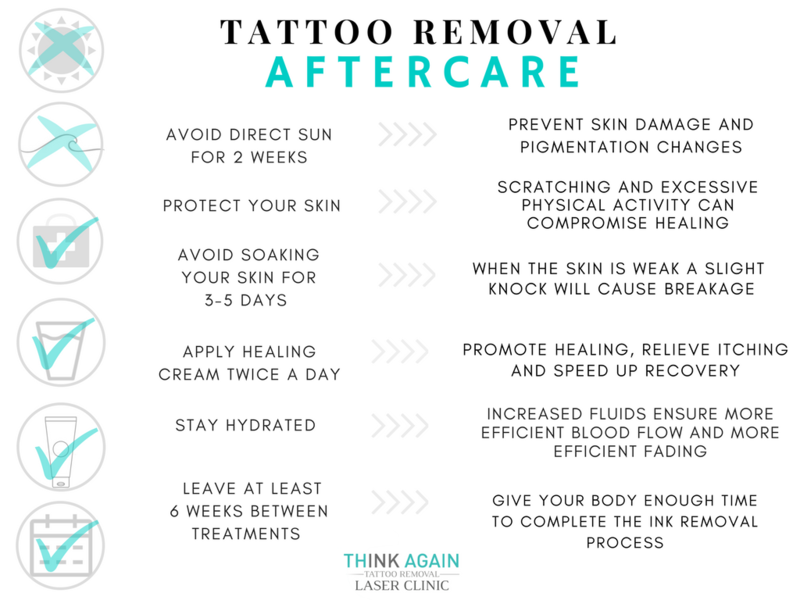 It is essential after being treated for laser tattoo removal, that you take very careful yet simple steps to ensure your tattoo heals properly and is not at risk of damage in the ensuing days and sometimes weeks. 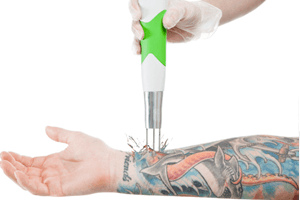 The typical post care reaction after tattoo removal can be anything from swelling, redness and bruising, all the way (in rare cases) to blistering. Although uncommon, blistering can be a normal part of the healing process particularly when treating coloured inks (however using our fractional laser this is reduced by 85%!). The important part is that you maintain a good level of care all the way up until your next treatment. This will ensure your skin is in optimal condition for your next treatment. This allows your clinician to get more out of the treatment and an overall better result. 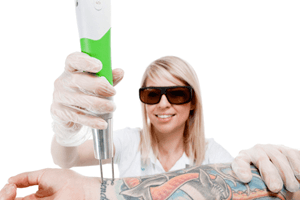 At Think Again Laser Clinic, we are tattoo removal specialists. Our clinicians are dedicated ONLY to tattoo removal. We treat up to 70 clients per week, and in doing so, have a knowledge level second to none in the industry. The significance of this is that we do not simply read a recommended guideline for each treatment (many clinics have a chart on the wall with a guide that they do not stray from, this is absolutely the wrong way to operate). We instead tailor the treatment to each individual case and tattoo. By returning to the clinic with your skin in perfect condition we will be able to get more out of your well hydrated and healthy skin to ensure a successful treatment with a minimised risk of any skin damage. In some cases, if the skin is not in a condition judged as suitable by your clinician, your treatment may even need to be postponed! At Think Again Laser Clinic, you are OUR priority. If you are ever uncertain at any point during the weeks following your treatment, you should reach out to our 24/7 information line, manned at all times by one of our experts. You will be able to call, text or send a photo at ANY time of day, to get real time expert feedback on your tattoo. There is literally NOTHING you can show us that we haven’t seen before and we would rather you guys ask a simple question than to sit at home worrying. After your treatment you will be given very detailed written and verbal instructions on how to look after your tattoo properly. You should keep this document handy until you are comfortable with the post care. 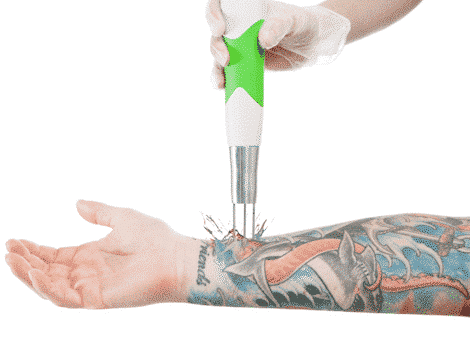 If any issues arise, either reach out or refer back to your tattoo removal bible! There you have it, 6 easy strategies you can employ during the healing phase of your tattoo removal journey to ensure you get the most out of each session. These steps will allow your skin the best opportunity of recovery and ultimately leave ZERO evidence of ever having ink in your skin. Put in a small amount of effort in and you wont regret it. Is your clinic living up to your expectations? Are you being given the right level of attention after your treatments? Maybe its just time to visit Australia’s leading tattoo removal clinic. Contact the clinic today to schedule your FREE consultation (Click here) and find out what we do different, which sets us apart from the rest.